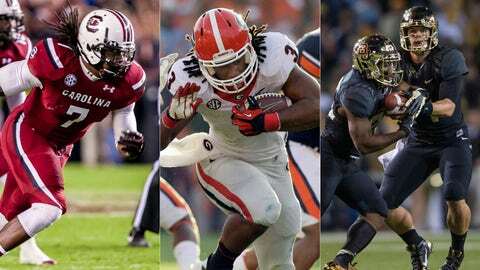 Jadeveon Clowney (left) may be playing in his final game for South Carolina in the Capital One Bowl, while Georgia's Todd Gurley (center) will try to jumpstart his Heisman campaign in the Gator and Bryce Petty, Lache Seastrunk and Baylor make their BCS bowl debut in the Fiesta. All hail New Year’s Day. It’s a college football holiday, one so gloriously wrapped in excess that we can’t look away — or at least we’re given enough to watch that we don’t have to — with six games spanning from noon until the last minutes of Jan. 1. From a bowl rematch to a pairing of BCS bowl newbies and stars like South Carolina’s Jadeveon Clowney, Wisconsin’s Melvin Gordon and James White and Baylor’s Bryce Petty on display, it shouldn’t disappoint. Here is your viewer’s guide to the New Year’s Day games, with reasons to watch each and every matchup. Why You Should Watch: Yes, we’ve seen this one before, but things are very different for the Bulldogs and Cornhuskers than when Georgia won 45-31 last year in the Capital One Bowl — especially under center. Georgia lost its four-year starting quarterback, Aaron Murray, to a knee injury on Nov. 23 and Nebraska’s Taylor Martinez (also a four-year starter), has played just once since Oct. 26, and is ruled out for this one. Without those program stalwarts, it puts the focus on a clash of two of the nation’s top running backs in Cornhuskers junior Ameer Abdullah (a Big Ten-leading 1,568 yards along with eight scores) and Georgia sophomore Todd Gurley, who ran for 903 yards and 10 TDs in an injury-plagued season. A big game could be enough to jumpstart Heisman Trophy talk for next fall and considering Georgia’s defense allowed 322.3 rushing yards per game against top-20 rushing attacks (which Nebraska is at 19th) and the Huskers gave up 161.2 per (59th) on the ground, this may wind up being a showcase for both of them. Why You Should Watch: These aren’t the most storied programs playing on Jan. 1, with the Mean Green having won just one bowl win in their history and UNLV making its first postseason appearance since 2000. But this will serve as a platform for two of the more underappreciated turnarounds of the year. North Texas went 13-58 in the six seasons before Dan McCarney took over, and after going 5-7 and 4-8 in his first two years, the Mean Green broke through this season by beating three bowl teams (Ball State, Middle Tennessee and Rice). UNLV’s Bobby Hauck delivered a similarly impressive year that seemed to come out of nowhere as the Rebels won two games in 2010, ’11 and ’12 only to go 7-5 this fall, with four of those losses coming vs. Minnesota, Arizona, Fresno State and Utah State. As for the game itself, it will likely come down to whether a Rebels team that is 102nd in red-zone offense can have any success against the nation’s top-ranked D inside the 20-yard line. Why You Should Watch: It is, in all likelihood, the final game of Clowney’s college career. Statistically-speaking, the preseason All-America didn’t live up to the hype as he totaled three sacks after having 13 a year ago, and of late he’s made more waves with his driving than anything else. But the junior defensive end — who figures to go as high as No. 1 in April’s NFL draft should he leave school early — remains one of the most intimidating presences in the game. Clowney and a D-line that this year has been led by another All-American in Kelcy Quarles (13 1/2 tackles for loss, 9 1/2 sacks) will get an intriguing matchup against the Badgers, who are eighth in FBS in rushing (283 ypg) behind Gordon (1,466 yards and 12 TDs) and White (1,337 yards and 13 scores). The Gamecocks haven’t been dominant against the run, allowing 142.3 ypg (33rd), which could prove problematic here, but they’re third in the SEC with 83 tackles for loss, and an ability to get into the backfield will prove helpful against a team that’s dedicated to the ground game. If this is indeed Clowney’s send-off, no matchup would seem to be better suited for him to make a statement. Of course, it could just be a continuation of a letdown season as he’ll try to outdo the Big Ten Defensive Player of the Year, Badgers linebacker Chris Borland. Why You Should Watch: Is Anthony Jennings ready to lead LSU? The freshman QB took over when Zach Mettenberger tore his ACL against Arkansas, leading the Tigers on a 99-yard scoring drive in the 31-27 win, but overall Jennings remains inexperienced, appearing in small doses in eight games. That would seem to give Les Miles the edge as the Hawkeyes’ seventh-ranked defense doesn’t fully known what the dual-threat Jennings is capable of, especially with the benefit of more than a month for the Tigers to prepare with Jennings at the helm. He’s certain to be tested vs. a defense that allowed 303 ypg behind a strong group of linebackers led by Anthony Hitchens’ 102 tackles, including 13 for loss. Iowa can be sure to see plenty of RB Jeremy Hill (1,185 yards and 14 TDs) and WRs Jarvis Landry (75 receptions for 1,172 yards and 10 scores) and Odell Beckham Jr. (1,117 yards and eight TDs on 57 catches). There’s enough explosiveness that LSU doesn’t need Jennings to do more than be a game manager, but the threat of his running could change the complexity of the Tigers offense and give a strong glimpse of the future for the Bayou Bengals. Why You Should Watch: Come for the defense, and to see which offense can do just enough to emerge with the win. Stanford held opponents to 14 points or less four times in the last seven games, never allowing more than 20 in that span. Meanwhile, Michigan State gave up six points or less five times and limited Ohio State to 22 points below its season average in the Big Ten title game, though it is going to be without senior linebacker and captain Max Bullough, who is suspended. With that level of opposition, points will be at a premium and the Cardinal would seem to have the edge in generating them behind the trio of QB Kevin Hogan (2,487 yards and 20 TDs to nine interceptions), RB Tyler Gaffney (1,618 yards and 20 TDs) and WR/KR Ty Montgomery (161.0 all-purpose yards per game, ninth in FBS). They helped Stanford average 42.5 points over the last three games. The Spartans have progressed on this side of the ball too, with QB Connor Cook throwing for 1,393 of his 2,423 yards and 11 of his 20 TDs in the last six games. Meanwhile, RB Jeremy Langford is an underrated workhorse with 269 carries for 1,338 yards and 17 scores. But they’ll be facing a Stanford defense that is more tested, having faced four offenses ranked in the top 10 at the time of their games; Michigan State has seen two, one of which (Indiana) didn’t make a bowl. Why You Should Watch: This is both teams’ debuts in a BCS game and there may not be a better matchup of QB/RB combos in any bowl than Baylor’s Bryce Petty and Lache Seastrunk vs. Blake Bortes and Storm Johnson at UCF. But the stars are just a bonus. The one very simple reason to watch is to see if the Golden Knights take the Bears’ top-ranked offense out of its rhythm? Averaging 624.5 yards and 53.3 points per game (both No. 1 in FBS), Baylor was kept under 35 points twice — 30 by Texas and 17 by Oklahoma State. The fact that UCF possesses a D that is yielding 19.6 points (13th) and 346.3 yards (19th) bodes well, but it’s the same unit that’s allowed 581 yards to lowly Temple, 490 vs. South Carolina, 455 against Penn State and 445 to Louisville. Keeping it close is UCF’s M.O. and it’s a position the Knights have thrived in, with eight of their games decided by seven points or less and five by three points. They’ve gone 7-1 in those outings.